CNN's Chief International Anchor Christiane Amanpour interviewed Vogue’s Anna Wintour in New York on Friday April 5, 2019. Wintour’s 2019 Met Gala is scheduled for May 6, with the theme ‘Camp Notes on Fashion’ , a topic at the heart of Gucci’s brand revival under creative director Alessandro Michele. Curated by Andrew Bolton, the exhibit opens to the public on May 9. "I like to say that we go from sun kings to drag queens in the show; it's to be hoped that there will be plenty of both, not only at the gala but also coming to see the exhibition," Wintour says about the exhibit. The organizing committee for the event includes the top names in fashion and especially acting, with Bradley Cooper, Blake Lively and Ryan Reynolds, Chadwick Boseman, Lupita Nyong’o and Jennifer Lopez with fiance Alex Rodriguez on the list. For a complete rundown, read The Hollywood Reporter. Last year’s theme focused on the Vatican’s influence on fashion, giving Lena Waithe the opportunity to make a major fashion statement in the time of Trump. Wintour talks politics and values with Amanpour. Amanpour writes that Wintour referenced multiple times during the interview the need of “taking a stand”. Both her support of Hillary Clinton and agony over the election of Donald Trump to the US presidency are well documented. Wintour put Michelle Obama on Vogue's cover three times, and the magazine has recently profiled Senator Kamala Harris and Rep. Alexandria Ocasio-Cortez. Asked about Vogue's forays into politics, Wintour said: "I don't think it's a moment not to take a stand ... I believe, as I think those of us who work at Condé Nast believe, that you have to stand up for what you believe in and you have to take a point of view." Asked about the majority of Vogue political figures being Democrats, the editor-in-chief responded: "I think it's very, very important to have a point of view, and we profile women in the magazine that we believe in ... After the defeat of Secretary Clinton in 2016 (in particular), we believe that women should have a leadership position and we intend to support them." New Zealand's prime minister Jacinda Ardern, who received a staggering amount of praise for her response to the terror attacks on two mosques in Christchurch, is another female politician with major support from Vogue and Wintour herself. "I think that she's an exceptionally direct, articulate person," Wintour said of Ardern. "And there is no sense that she's ever on message. "She truly brought the country together in such a remarkable way that I haven't seen many other leaders achieve. And she was just so moving, and when she said, 'we are all one country,' it was a message that a lot of other leaders could learn from." Anna Wintour will celebrate her 70th birthday this year, and Condé Nast insists she’s not going anywhere. Amanpour’s interview happened the day after Condé Nast appointed Roger Lynch, former CEO of the music streaming service Pandora, as its first global chief executive. "Anna Wintour is an incredibly talented and creative leader whose influence is beyond measure," Sauerberg's statement read. "She is integral to the future of our company's transformation and has agreed to work with me indefinitely in her role as editor-in-chief, Vogue and artistic director of Condé Nast." WWD quotes insiders as saying that British Vogue editor in chief Edward Enninful, most frequently brought up as Wintour’s future replacement, is not headed Stateside. "Edward is a brilliant editor," Wintour tells Amanpour. "And I think he's really, in his fearless style of editing, brought a completely different point of view to British Vogue -- with no disrespect to the editor that was there for many years before Edward. "I think that he's very passionate about race. He's very passionate about politics ... He is taking a stand and he is not trying to please everybody, because you can't in this day and age." NRA Puts Nancy Pelosi + Gaby Giffords Out For Target Practice. Will Sandy Hook Ruling Dampen Their Machismo? 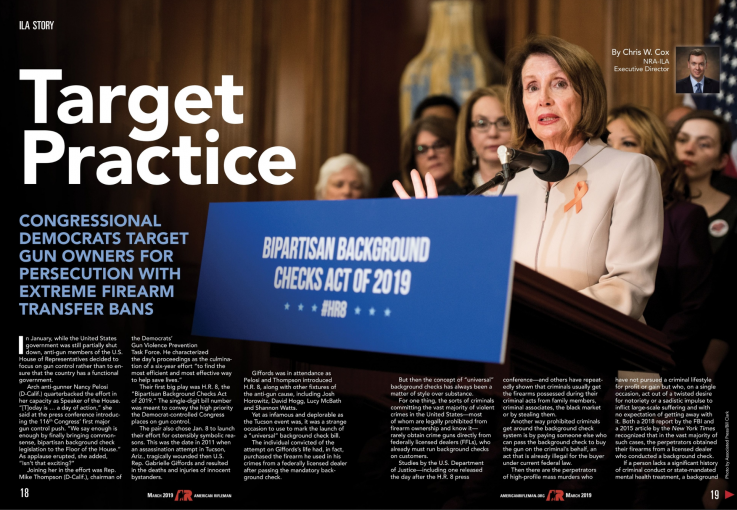 The National Rifle Association left little to the imagination in their March 2019 issue of American Rifleman, citing Democrat Speaker of the House Nancy Pelosi, and gun control advocate, former Arizona Congresswoman Gabby Gifford — herself an assault rifle victim — as in the line of fire and perhaps in need of a little target practice. On Feb. 18th, US District Judge Amy Berman Jackson found herself in the crosshairs after rejecting Roger Stone’s effort to get his case reassigned to a new judge. A target symbol appeared next to Judge Jackson’s head. Stone later shared a statement — which he reiterated when reached by BuzzFeed News — saying, "This was random photo taken from the internet .Any [sic] inference that this was meant to somehow threaten the Judge or disrespect court is categorically false." There’s no doubt that these are macho men. The white nationalist assassin from Australia who Facebook livestreamed with his assault on two New Zealand mosques Friday is also a macho man. that currently leaves 50 dead and 50 hospitalized — many in critical condition. On Thusday, March 14th, the Connecticut Supreme Court overturned a lower-court ruling, agreeng with Connecticut’s Sandy Hook families that the marketing employed by Remington Arms, a major manufacturer of deadly assault rifles and specifically the AF15, was so aggregious in appealing to men’s “killer instincts” that it transgressed against federal immunity laws that protect gun manufacturers from liability. Connecticut law, the court wrote in the majority opinion, "does not permit advertisements that promote or encourage violent, criminal behavior." While federal law does offer protection for gun manufacturers, the majority wrote, "Congress did not intend to immunize firearms suppliers who engage in truly unethical and irresponsible marketing practices promoting criminal conduct, and given that statutes such as CUTPA are the only means available to address those types of wrongs, it falls to a jury to decide whether the promotional schemes alleged in the present case rise to the level of illegal trade practices and whether fault for the tragedy can be laid at their feet." The NRA and Roger Stone will swear on a Bible that their words and pictures aren’t really meant to incite violence against Nancy Pelosi and Gaggy Giffords. We’re just clutching our pearls!! But if the US Supreme Court let’s the Connecticut Supreme Court decision stand, we might find fewer prominent women in the crosshairs of America’s macho men. Given Gabby Giffords permanent brain disability, and the mounting dead carcasses at the hands of testosterone-infused nationalists worldwide, we have every right to be concerned. One social conservative determined to kill me for supporting Planned Parenthood on TV is enough. The Republican hate machine has obsessed over Nancy Pelosi for years. At least now the Speaker has four young women besides her. They are all WOC -- ironically or not? We've not seen anything like the Republican hate machine being readied in particular against these four young women: Alexandria Ocasio-Cortez, Rashida Tlaib, Ilhan Omar and Ayanna Pressley. At least they've got broad shoulders to lean on and the best possible advice. And Madame Maxine will be in there, too, offering support. Right on, ladies! We may not agree all the time, but I am one person who will not tolerate needless attacks and misrepresentations of these young women -- solely because Republicans always need a female she-devil to obsess over. With 37 new Democratic women in Congress, the Repubican right wing — which is the only one active at this point — will probably lose their minds as the weeks go on. Especially if they ask smart questions like they did of Trump fixer Michael Cohen during last week’s hearing, these young women are standing on solid ground. That was a masterclass.